Every day, billions of internet users are inevitably vulnerable to hackers from across the world. While regular citizens are susceptible to attacks, so is the government. Professionals at Scott Air Force Base are tasked with ensuring our systems are secure and some of those airmen are passionate about cybersecurity outside of work, and on a personal level. Beginning July 25 thru July 26, the local chapter of the Military Cyber Professionals Association will host an event to teach citizens ways to prevent hackers from breeching their systems. SSgt. Raymond Evans, the group’s event coordinator, explained that officials from the Department of Defense track three types of hackers- white, gray, and black hat hackers. Black hats hack systems for malicious purposes, such as stealing identities and other sensitive information. Gray hats’ hacking intentions could be good or bad depending on their agenda. White hat hackers collaborate with companies to identify system vulnerabilities to teach people basic cyber securities and help strengthen defense systems. “St. Louis on the Air” in 2013 talked with local resident and white hat hacker Charlie Miller about security in the digital age. Lt. Paul Jordan, president of the St. Louis Chapter, said that some of the basic techniques citizens can use to protect themselves include creating strong passwords for accounts and changing them regularly, and prioritizing what accounts need more protection than others (such as bank accounts versus social media accounts). “If you understand how to think like an attacker, then your chances of being able to defend an attack greatly increases,” Jordan said. 2015 Military Cyber Professionals Association Capture the Flag! 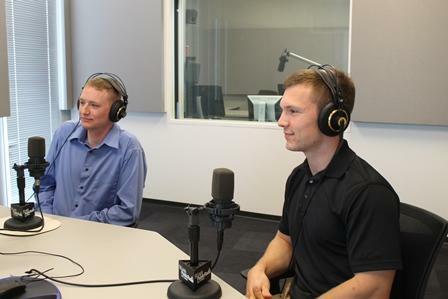 When: July 25 at 9:00 a.m.- July 26 at 3:00 p.m.
Two U.S. airmen share cybersecurity techniques on "St. Louis on the Air" with host Don Marsh. “Apocalypse Now? : NYSE, WSJ outages spook Twitter"
“Ladies and Gentlemen, It’s Time to Panic"